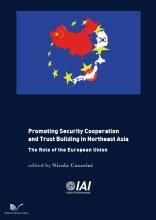 This book contributes to current debates on Northeast Asia’s evolving security dynamics, including the role of the EU in promoting regional cooperation and trust building. The chapters have been written by a select group of European and Korean experts with the aim of shedding light on some of the initiatives being developed in Northeast Asia to promote regional cooperation and trust building. At the same time, they also examine the distinctive role that Europe has been playing in supporting some of these plans, including discussion of how – and to what extent – the EU’s approach differs from that of the United States. Output of the project “Trust-building in North East Asia and the Role of the EU”, conducted by the Istituto Affari Internazionali (IAI) with the kind support of the Korea Foundation.